Congress will be busy with future tech initiatives and members have high hopes for the potential of current programs, according to two congressmen who spoke June 7 at MeriTalk’s Cloud Computing Brainstorm. Congressional IT leaders Reps. Will Hurd, R-Texas, and Gerry Connolly, D-Va., talked about the future of major IT initiatives such as FedRAMP, the Modernizing Government Technology (MGT) Act, FITARA, and executive leadership, offering insight into the shape of IT developments in the coming months. 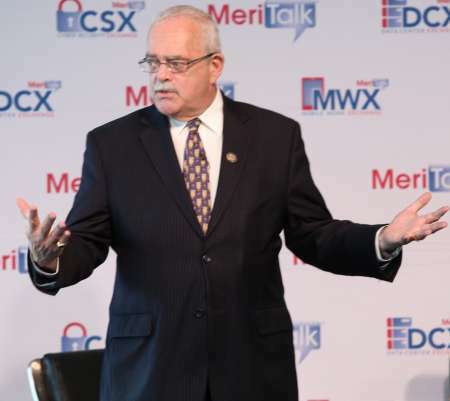 Though Connolly has been a longtime critic of the slow nature of FedRAMP’s cloud authorization process, and even threatened legislative intervention, he told MeriTalk that recent data has diminished his desire to intervene. Connolly added that he would like to explore how the FedRAMP process ended up in such a bad place, and how they were able to turn things around, and Hurd said he plans to call a hearing on FedRAMP to explore how the process can be improved even further. Hurd reached out to audience members for their own input, explaining that his understanding of the pros and cons of the process comes only from third-party accounts. Ultimately, Hurd said that the process should not become more bureaucratic, and that government should stop trying to find perfect security solutions. Both Hurd and Connolly expressed high hopes that the MGT Act would pass the Senate and get signed into law in the coming months, enabling agencies to begin using the bill’s provisions for modernization funds. However, Hurd emphasized that agencies would need to be active in making the case for exactly why and how they will use the appropriations funds to improve their IT. Connolly said that MGT would likely act as an addition to the work already done by his legislation, the Federal Information Technology Acquisition Reform Act. When asked if the use of MGT could be incorporated into FITARA scorecard evaluations, Connolly said that there was no reason it couldn’t be, as the members of Congress dealing with one were the same ones dealing with the other. Hurd was more definitive about the two bills’ potential. “As long as I’m the head of the IT subcommittee, it for sure will be. It should be, because part of FITARA is about modernization,” said Hurd, adding that there will certainly be questions for the agencies that decide not to take advantage of MGT. A recently signed cybersecurity executive order places agency responsibility for their cybersecurity posture with the agency head, driving IT responsibility up the chain of command. Hurd welcomed the order as a positive addition to leadership goals established in legislation like FITARA, which gives the CIO full responsibility for their agency’s IT. Connolly said that the IT-focused members of Congress and agency CIOs need a partner at the top, such as someone to fill the currently vacant Federal CIO position, to succeed. According to Hurd, his next major hurdle is going to be establishing a Cyber National Guard to address Federal workforce shortages by offering scholarships to cybersecurity students in exchange for government service. However, he told MeriTalk that a lot more work has to be done before that legislation can be put on the table. Hurd said that he wants to establish plans for how to manage the scholarships, where to place the recipients within the government, how often those people would need to be on loan from their private sector jobs, and how to standardize Federal cybersecurity job listings.